Stick a fork in it, it's done. Use this advice when testing your potatoes for tenderness during cooking. Potatoes do not change their appearance when they become tender during cooking. You must periodically test the potatoes in the water as they cook for tenderness. Perfectly cooked potatoes are neither mushy nor hard but give easily when punctured with a fork or skewer. Scrub and optionally peel the potatoes. Cut the potatoes into the same size chunks for more even cooking. 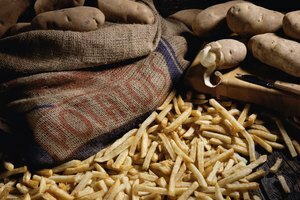 Having the potato pieces all the same size will ensure that they are all cooked to the same level of tenderness. 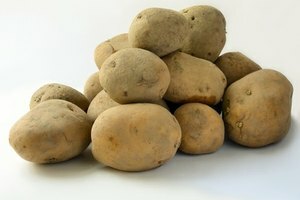 Place the potatoes in a cooking pot and cover with cold water. Bring the pot to a boil over medium-high heat. Boil the potatoes for 20 to 30 minutes. Insert a skewer or fork into a piece of potato after 20 minutes in the pot. If the skewer goes in and comes out without resistance, the potatoes have finished cooking, but if the potato feels firm against the skewer, return the test potato to the pot and continue to cook the potatoes. Test the potatoes again at 25 minutes and 30 minutes if they were not finished after 20 minutes. Drain the finished potatoes through a colander to keep them from getting soggy. 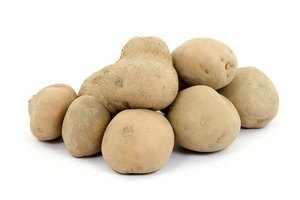 Opt for new or red potatoes for boiling if you want the potatoes to retain their shape in a salad or casserole, but boil russet potatoes if you want the potatoes to be soft enough to mash. 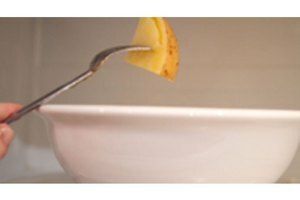 Use this same fork-tender test when baking or steaming potatoes.